Jason Baker/Wikimedia Commons (CC)This vault could soon be full of Commerzbank’s money. One of the largest banks in Europe, Germany’s Commerzbank, is reportedly considering hoarding billions of euros in cash in vaults, rather than depositing it with the European Central Bank. Several people familiar with the matter say that Commerzbank is looking to store the cash in order to avoid paying to hold the cash with the ECB, thanks to the bank’s negative deposit rate for lenders, according to a report from Reuters. No decision has been made yet, according to Reuters’ sources, but Commerzbank has discussed the idea of vault storage with the German authorities. 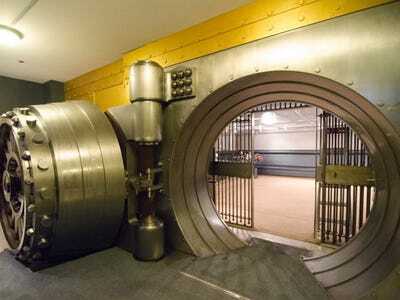 It is not understood exactly how much the bank would look to store in its own vaults should it do so. Commerzbank is part-owned by the German state, which has in the past been critical of the ECB’s negative rate policy, with Finance Minister Wolfgang Schauble particularly vocal about what he sees as the ECB’s failings. In April he said negative rates were causing “extraordinary problems” for Germany. Draghi has not ruled out taking rates even lower, although earlier on Wednesday bank official Francois Villeroy de Galhau, a member of its governing council, said that there is “a limit” to how low negative rates can go.